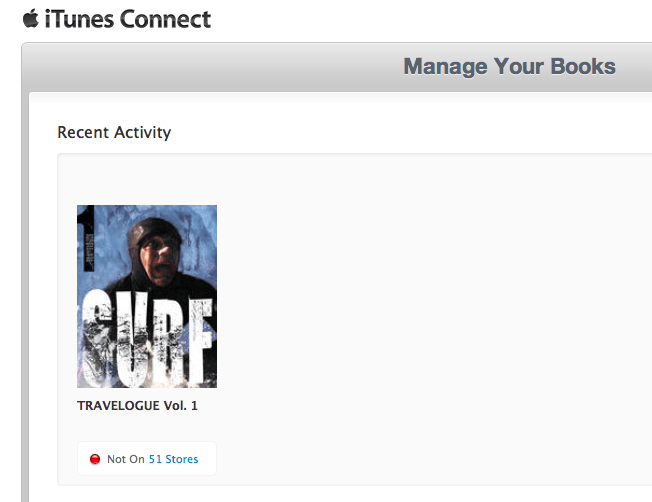 I just finished Travelogue 1 and uploaded it to the iBookstore using iTunes producer. The process was amazingly simple and fast. In fact it is so simple and fast that it feels like an anti-climax. It’s amazing to realize that you can now commercialize a book with a few clicks of the mouse. It took me a while to understand that while your create your ibook as a .iba file with iBooks Author, it has to be submitted as a .ibooks file. While you may not see the conversion as iTunes Producer will handle it automatically for you, it does matter if you want to create and upload your own sample book. You will need to export your sample chapter as a .ibooks file to be able to upload it. A week after submitting Travelogue 1, I received notification from Apple that the book had been approved and was now available in the iBookstore. Two days later, I was actually able to find it on the store and to download it directly on my iPad. Overall, the process was incredibly easy and smooth – a revolution in publishing. As a designer and artist myself… your book, your art is wonderful, beautiful…and wonderfully executed!! And I can’t wait to see your iBook Israel..as my husband is an indeFilmmaker and is doing HIS documentary on Israel, having been born there in 1950…and guess what…im doing an ibook & eBook.. I love the interactivity possible with Apples iBook..but i HATE that only iBooks can be viewed with full activity via THEIR hardware etc!! ANYWAY…. YOUR work is FABULOUS!!!!!! best.. Thank you Rose! The next book is -almost- finished so stay tuned!